You’ve probably heard the phrase, “she be small, but she be mighty”. That pretty much describes Ricky Polcer of Tyler, Texas. Though a woman of small stature, that has not deterred her from finding needs and filling them. 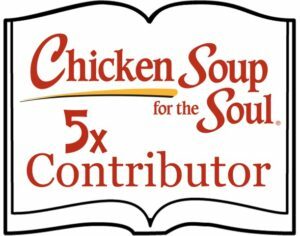 Like others profiled on this blog, she radiates goodness. Her story begins with quilts, simple quilts that comfort people across the United States. She learned the craft from her aunt who taught her how to piece together fabrics at the age of eight. She didn’t get serious about quilt making until her retirement from the civil service in 2001 and then she began making quilts and more quilts and yes, more quilts. To date Ricky has made over 1,120 quilts since she hung up her day job and began using her talents for helping others. 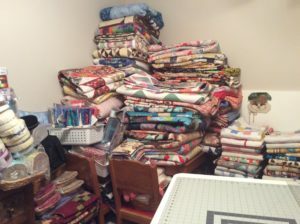 Of course you must be wondering what one woman needs or does with 1,120 quilts. Charity. She makes quilts for charity. And are they grateful! Ricky also sews for the Quilts for Kids chapter in Austin, Texas, an organization that provides quilts to children with life – threatening illnesses and children of abuse. Ricky’s says “I love knowing I’ve provided someone with warmth and love, giving throughout the year, it’s a good feeling.” She had made and donated 982 quilts to QFK to date. Those child and teen quilts go to a variety of local kids’ causes such as CASA, (Court Appointed Special Advocates), for newborns to teens aged 18, who are removed from their homes due to neglect, abuse, parent incarceration or death. Another group that receives her quilts is Hospice Austin for newborns to kids up to 18 who are either a Hospice patient or have an immediate family member in Hospice. A third organization who receives her quilts is the Dell Children’s/Ronald McDonald House for children undergoing long term treatment for a life altering disease or condition. And then there are the girls at New Life. These children aged 11-18 have suffered the unfathomable: severe physical, sexual and mental abuse. The girls who live in and go to school at New Life undergo psychiatric intervention to turn their tumultuous lives around. Many are suicidal when they enter New Life. My gosh, what do you do for a kid like that? Ricky knows; she has made a bunch of quilts for the girls as well as 288 pillow cases that the girls received at the holidays. To give the girls something fun to purchase in the New Life facility store, she whipped up 104 cosmetic bags that they girls can “buy” using good behavior points that work like money. To make sure there was makeup the girls could buy to put in the cosmetic cases Ricky purchased 200 e.l.f. cosmetics to line the store shelves. She also made 36 fleece throws and 153 totes the girls can purchase in the little store. Does this woman have a heart as big as Texas, or what? She makes the Energizer Bunny look like a slacker especially because that’s not all this spunky woman does. Ricky is as passionate about her other “hobby” as what she sews for those in need. 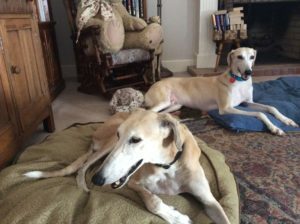 Since 2007 when she took in her first greyhound and got involved with Greyhounds Unlimited of Dallas, Texas she has been fostering and adopting the elegant former racing dogs. To date Ricky has fostered 10 “greyts” with medical issues, and adopted eight. At this time she cares for two greyts, an eight year-old named Jinx and seven year-old Manuel. To be expected she sews for the dogs too, items like fleece belly bands to keep male dogs from marking the inside of a house. The woman’s energy knows no limits. I’m not sure that this dynamo eats or sleeps, how else does she do it? I imagine that joy and the elation of giving back plays a big part. 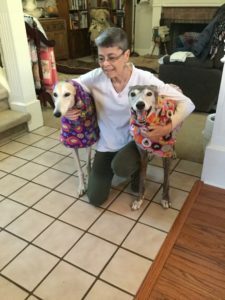 When asked her favorite part of quilting she answered, “I treasure the quiet time with my greyhounds at my feet helping.” For Ricky, quilts and greyhounds go hand in hand. Quilts and greyts, what a sweet combo. Do you know of a selfless hero or heroine like Ricky Polcer in your town? If so, I’d like to hear about it. Please leave a comment below. they can. 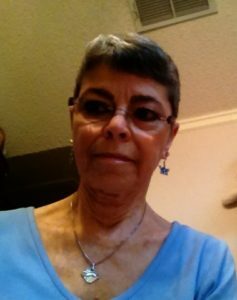 Thank you for bringing this wonderful lady’s acts of love to our attention, 4 gold stars for her. No, Seriously … Do it!